Starfish Signs and Graphics is a Signworld company located in San Clemente, CA, that provides amazing signage solutions for South Orange County for over two years. 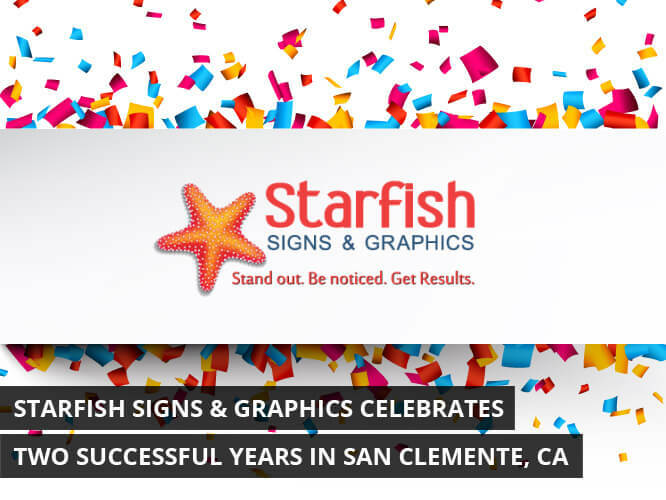 Starfish has found its niche in this competitive sign market by creating a culture of ideas, focusing on outstanding customer service and crafting creative business sign solutions, such as lobby signs, monument signs, building signs and vehicle wraps. The team at Starfish Signs, led by Mike and Laura Reilly, is celebrating the success of their business by having their annual company celebration at the Casa Romantica’s “TOAST TO THE CASA” Event in San Clemente, CA. Just what makes Starfish Signs & Graphics so special? Mike and Laura Reilly founded Starfish with the concept of having 5 “arms” that serve as the root of the business. Just like a starfish, our business needs all five to survive: People, Products, Customers, Sustainability, and Community. One of the services that Starfish Signs and Graphics has become a leader in is the design, manufacture and installation of lobby signs. Starfish uses several material combinations and innovative techniques to craft some of the finest lobby signs in Southern California. Starfish Signs and Graphics also specializes in car wraps, monument signs, building signs and wall graphics, just to name a few things. When your travels take you to sunny San Clemente, feel free to stop by the showroom and see why Starfish Signs and Graphics has made such a splash in the local community.